This morning I am going to share a secret, ok....it is a tip really. A secret just sounded more enticing. I discovered this tip somewhere about a week ago & I had been dying to try it out. If I could remember where I found the info, I would certainly thank them. It is something that I noticed the immediate benefits of. I'll explain in a second. While I have your undivided attention, I'd like to ask a few things. I am trying to rebuild my real estate career. In doing so, I have created a like page on Facebook since I am nearly at the 5,000 friend limit. Please take a second to either click here or to just "like" me on the handy dandy little box on the left side of this blog. Thank you so much in advance for doing this. Also, if you enjoy my blogging, please become a follower of this blog. Right now, I feel as if nobody is reading what I am writing. My blogs have been pretty popular in the past but it seems as though healthy living is not as of much interest as I had hoped. So, boost a girl's ego a little if you don't mind. You can also have my updates sent directly to your email within seconds after I publish if you would like. This is how I keep up with most of my favorite bloggers. Enough housekeeping. I am ready to share the big "secret". A close friend of mine told me about this amazing shredded chicken that she purchased at Cosco several months ago while out of town. How awesome!? Shredded chicken...all ready to go for soups, stews, tacos, fajitas, dinners, or anything else. The bad side? They have added tons of sodium, increased the price, & our Cosco here doesn't even carry it. She asked them to order it at least six months ago & it still hasn't happened. 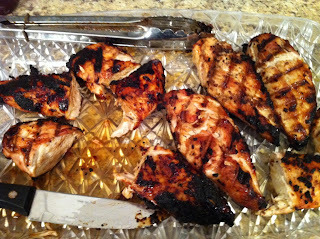 Last week we grilled some yummy chicken on the grill. I marinated mine in a little extra virgin olive oil, garlic, & onion. I made BBQ for the kids. Then, I tried out the "secret". 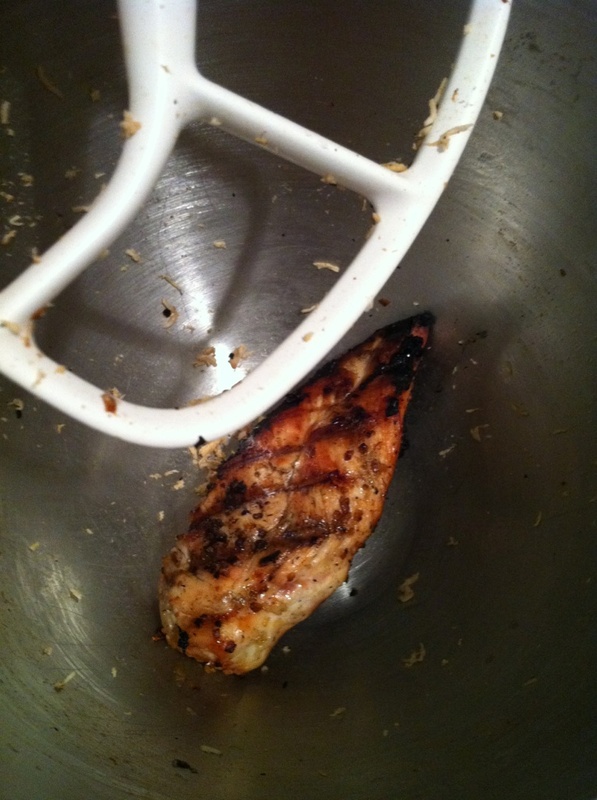 I put a chicken breast into my kitchen aid mixer with the paddle attachment. Locked it in place & turned it on medium. 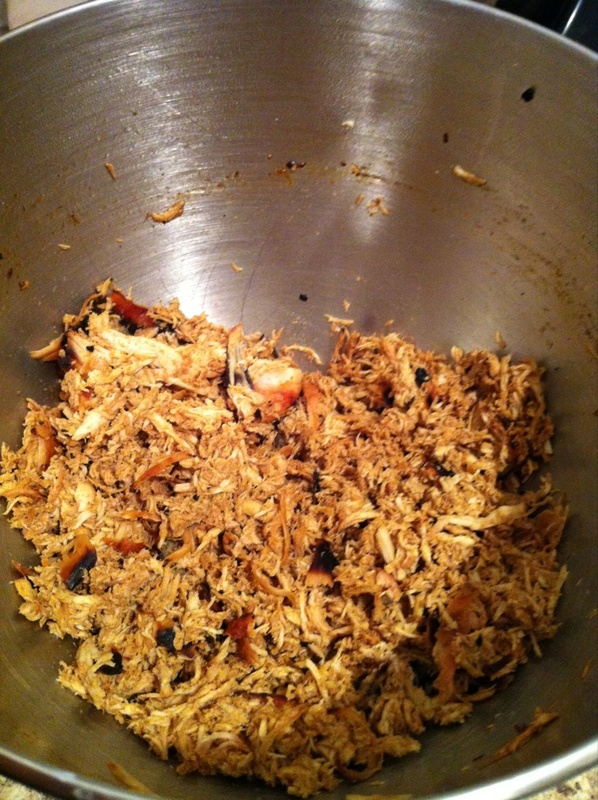 Gorgeous, lovely, already shredded up chicken. No more taking the time to cut up chicken for all three of us... no work at all really. The best part, the kids ate more than they usually would. They totally cleaned their plates & both asked for seconds! I couldn't believe it. My kids LOVING chicken. Woo hoo! I have been enjoying the leftovers all week for lunch. I imagine that you could use a food processor for this but I always worry about the blades & honestly, a food processor has more pieces to clean. Since we eat chicken several times a week, this tip is going to be a huge time saver for me. Besides, anything that gets the kids to eat more of it....works for me!!! Up for a REALLY Easy Challenge? I am not much of a reader. I wish that I was, but I can never seem to sit still long enough. There is always something else that can be done & to be honest, taking care of or doing something for ME that doesn't benefit anyone else (in the immediate sense), is something that I have always had a hard time with. I have many books that I haven't been able to finish, even ones that I REALLY like. So when I decided to go Paleo a few weeks ago, I made a list of all of the great resources that I needed to check out. When I say check out, I mean check out....of the library. For free. I am trying to make this a new requirement. If I read the whole book, I liked it, & I will use it in someway again...then MAYBE I will buy it. We are actually doing this with video games too. There have been several instances where my son has "liked" a game (in his head), we spent $60 & then within an hour he says, "I wish I didn't get this game. I should have gotten xxxxx". As a single mom on a super tight budget, this is not a sentence that I like to hear. I found that the libraries available to me have a very small selection of Paleo books. I requested the three that they offer & was put on a wait list for all of them. This does not make an impatient & eager to learn person happy, but I was happy that they are desired enough to find out that 5 people were ahead of me for a particular book. Fortunately for me, the first book that I could get was one of the most popular, highly rated, and an easy read. 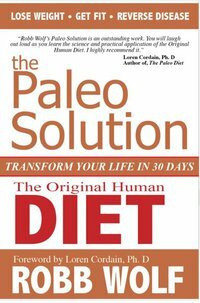 The Paleo Solution by Robb Wolf. This book proved to be an excellent book of basics. I am proud to say that after one extension at the library, I read it in four weeks & will be adding it to my Christmas list. This is a book that I will want to read again & will recommend to anyone considering going Paleo. Robb (we are on a first name basis...even if he doesn't know it yet) basically challenges you to try this only for 30 days. Don't want to jump in feet first? No worries! He goes on step further & offers a plan. 1. Start off with just changing your breakfast for one week. 2. Then lunches for one week. 3. Next you will try breakfast & lunches for one week. 4. Lastly, you will incorporate dinner along with all other meals for one week. * Have you ever had bacon & eggs for breakfast? * Have you ever eaten a salad with some chicken, shrimp, or grilled fish for lunch? * Have you ever had some meat or seafood with veggies for dinner? I am pretty sure that you answered yes to ALL of these questions. I know that you wouldn't dare lie to me. Right? So, you have already eaten "Paleo meals". Robb takes all of the guess work & opportunity for failure out of this for you. He offers meal plans, recipes, exercises, research, & so much more. He lets you start out at a snail's pace & still is confident enough that you will see results. Based on what I have read over the past few weeks...ok, mainly over the weekend, I will be modifying a few things. I am going totally basic on this one. Following Robb's tips only. Since I have already been eating Paleo, I don't need the slower entry plan. I am already convinced. I have felt the differences. However, I will be switching up a few ingredients, exercises, & may even add an extra hour of sleep at night than I already have. This month I have gone from 6-7 hours/night to 7-8. What a change! I love it! With that being said.....I don't want to throw out a 30 day challenge & have you all click off the page without a second thought. How about a 7 day challenge? How about a 6 day challenge since this is already Sunday night or Monday (depending on when you see this) & you may need to go to the store? Switch one meal everyday for one week. That's it. Next week you can add another meal or just switch a different meal. Your choice. Sounds pretty easy, right? With over 81,000 meal choices you bet it is easy! I would love for you to join me so I can hear all about your journey & how amazing you start to feel. It will keep me going too. I mean, that is why I am blogging.....to help others. I don't need to do this for me. YOU feeling better, looking better & being healthier than you ever have is why I take the time to blog. But hey, maybe none of those things matter to you. Maybe you are 100% totally happy with who you are. Up for the challenge? Ready to go? Email me at: TeamLivingHealthy@gmail.com. I will send you a PDF of the Paleo Food Matrix that was put together by Robb Wolf. If you can't make a change that it is this easy...what else are you going to do? Honestly. At 11pm last night, I wasn't sure that I would be making it in to work today. My underage minors had consumed one too many pieces of candy last night. By bed time they were both complaining of tummy aches & had a handy dandy little bowl next to them...just in case they would be seeing that candy for a second time. Halloween is much like having a night on the town drinking. You get all dressed up, have a few drinks, have a few more drinks, think you are having the time of your life, & then.....POW. You don't even know what happened & you feel awful the next day. I was wrong last night to think that only trick or treating for a short time (45 minutes to an hour) would limit the candy & therefore the consumption. They still received a ton of "treats". Way too many. The picture below is ONLY Brandon's candy. Allyson didn't sort hers so she wouldn't allow any photos. 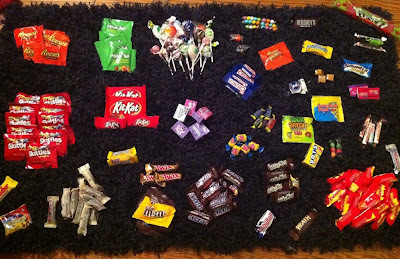 I can't even begin to imagine how many calories are there & how many grams of sugar are sitting on that rug. Makes my belly hurt to even think about it. The kids went from not wanting to share a single piece, to offering up their entire stash by the end of the night. As Brandon laid in bed last night, crying because he was worried that he was going to get me sick, he apologized for eating so much. (All in all I think he had about 7-10 pieces.) He looked absolutely terrible, like he had been beaten. He couldn't get comfortable, was laying in fetal position, & was going through a sugar crash. When he told me that I could have all of the candy that he had left, I reminded him that I am not eating sugar anymore. I reminded him of how great I have felt since I cut it out. I have been especially proud of him the last few weeks because he has accepted my new lifestyle the best. He eats the majority of what I eat & he is happy to do it. I am setting a good example for him & that means more to me than anything. Ally is SLOWLY making better choices & I am extremely proud of her as well. She tends to think that she can eat whatever she wants & because she is "skinny", it is okay. Health is not important to her. That is my job. Our kids see what we do & they imitate it. They want to be us. If we are excited about healthy eating they will be too. If we care about fitness & being active, they will too. If we like to cook, they will want to help us. You have the opportunity to make a change in your family, your children's family, & their children's family. So make a change today! Hide some of the candy, limit their consumption, but at the very least....don't eat it yourself. If you are consistent, they will follow. Baby steps. Small changes will over time show BIG results. I hope that everyone is enjoying their weekend. I am not sure where today has gone, but I can't believe how late it is already. So, this morning I posted about Chia seeds so I want to do a little post about them. First, I have a few other things that I want to talk about. 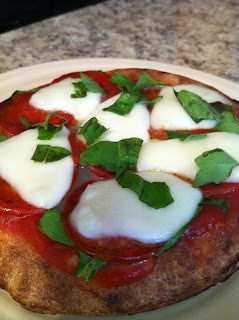 As promised earlier in the week, I tried out a new recipe that I found at The Gracious Pantry. Well, it was not a success in our home. In a few words.....frozen tanning lotion. I love coconut & I love bananas, but I did not love this. Maybe I used too much coconut milk, or maybe I will just focus on trying a new recipe next week. I haven't spent nearly as much time on her website as I would like & I already have 7 other recipes in my interested list. What recipe are you looking forward to making this week? Did you try anything yet? Come on folks, jump in this with me. It is worth it. Promise. If I have "regular" peanut butter, I am looking at around 190 calories & 16 grams of fat per serving. With PB2, that goes down to 45 calories & only 1.5 grams of fat!!! (I can't put enough exclamation points here.) The best part is that I only needed 1/2 of the serving in my shake. Now, if I want to have some almonds in the afternoon or in my morning oatmeal, I can! After tasting this today, I immediately ordered four jars. This is going to be a healthy staple in our home. A healthy food that will "feel" like a cheat, without ANY guilt. They even have recipes on their website that look amazing. I am so happy! If you want more info, you can click on the banner below or on the right of the page. With that being said, I want you all to know that I am only promoting foods, products, websites and blogs that I truly love myself, believe in, & think can benefit all of you as well. I feel so blessed that in a few short days, I have come across several things that are completely changing the way that I look at food, fitness, & overall health. On to the chia seeds. I have to admit that I was completely terrified to try these. I went to the health food store & asked them if I could purchase two tablespoons instead of the 1-2 cup prepackaged portion. They agreed. I am so happy that I tried this! Chia seeds do not have any taste but have amazing health benefits. Click here to review the nutritional information. So far, I have only used it in my oatmeal, but you can add it to just about anything. Chia seeds are considered a super food. I can write all night long as many of you know, but I will just leave you to this website instead. MyChiaSeeds.com. has a tremendous amount of information that will tell you everything that you need to know. Sprinkle some in your cereal, soup, smoothie, salad or just about anything else. You can even use chia gel to reduce the butter/fat in your baking. How do you use chia seeds? As a new week is about to turn the corner, what ONE goal will you post to make yourself accountable for this week? Seriously, just ONE new goal. ONE goal is a great start. Please join us. This weekend I went back & looked through several of my Clean Eating magazines. Now that I have a fresh, open mind, I figured that recipes that I may have passed up before might sound appealing now. I was right. I like the way that sentence sounded so I will say it again...I was right. Tonight's menu - Pizza per Uno with Garlic, Spinach, & Fresh Mozzarella. YUM! Based on the nutritional information in the magazine, I could afford two pizzas & still have room for my snack this evening so I was more than excited. 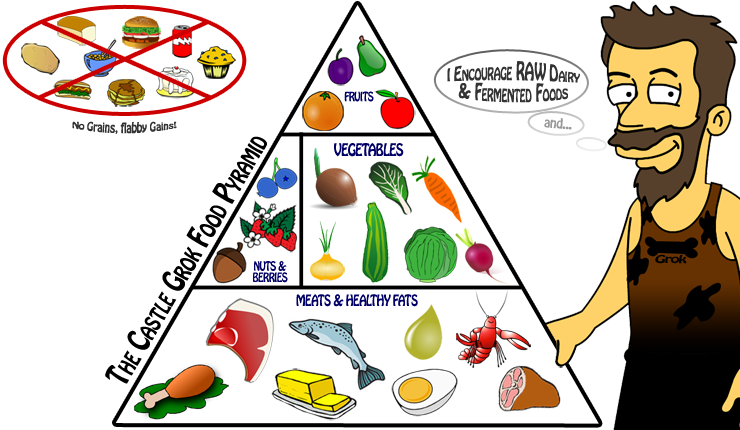 There is something about the words "clean eating" that keeps my children from getting excited. In fact, they make an automatic assumption that they will HATE it. I am sure that there are many of you that are agreeing with them right now. I am here & I hope that you will continue to follow along with me while we take a journey to find delicious clean foods. Just because it is good for you doesn't mean that it has to be nasty. Since I was making two, I decided to try out two toppings. If you look closely, you will notice just a few pieces of pepperoni in the first photo. (This was how I persuaded the kids to try it) Next time, no pepperoni. Ha! The second photo was mushrooms. Everything else was the same. I was extremely impressed with this dish, the ease, the fresh, healthy ingredients, it only took 8 minutes in the oven, & we all loved it. Success!!! This will become a regular weekly dinner. At least until we find more yummy clean eating recipes. You can find this recipe in the Clean Eating - January 2011 issue. 1. Preheat over to 400. 2. Mix sauce, red pepper flakes, & minced garlic together in a bowl & then divide sauce evenly on the two pitas. 3. 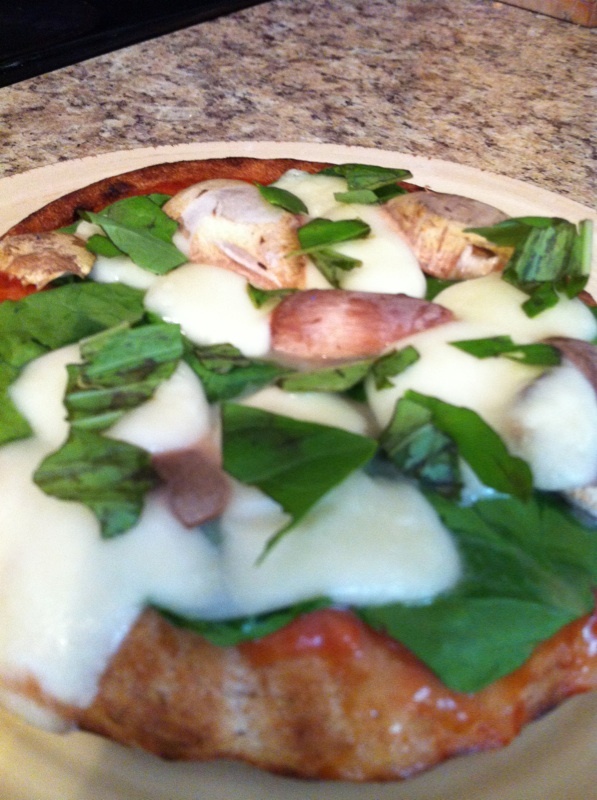 Sprinkle the spinach, place any other healthy toppings & then arrange mozzarella rounds on top. 4. Bake for 8-10 minutes. Again, my pita could have been much healthier so my nutritional information will improve next time. But it is still good & I am still well within my daily allotment of calories. 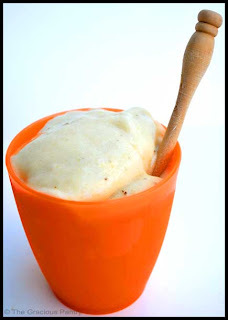 I am looking forward to tomorrow's Banana Coconut Ice Cream. If you would like to be sure that you don't miss out on a post, you can subscribe in the top right corner to have each post emailed directly to you as soon as I post it! Have a great evening, don't snack too late, & get enough rest. A few weeks ago I found a website/blog that I absolutely love! You can find it here. Basically, all of Tiffany's recipes are clean. I was looking around on her site a little tonight & started thinking....wouldn't it be great if we all committed to just ONE new recipe this week? One that is clean & healthy. One that we could easily share a link from the website so that we don't have to type out a recipe & directions. I think so. After you make your recipe & share with your loved ones, post the link to the recipe in the comments, if you made any modifications, had troubles, & what your overall suggestion for that recipe is. Is it a keeper? I think that I found my first experiment right off the bat. It is only TWO ingredients. Who said that eating clean had to be expensive? Now, Tiffany doesn't always post nutritional info so if you really want to wow us, you can include that. 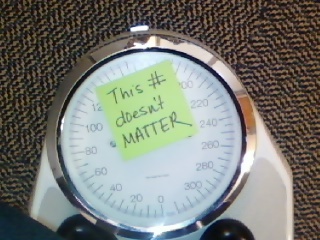 I am going to because I count & track all of my calories. It takes a day of prep & I need the groceries, so I am going to make mine on Thursday night. Honestly, I can't wait! 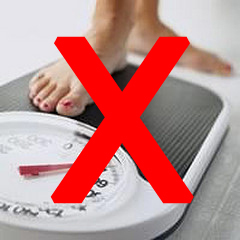 The question these days doesn't seem to be, who has tried dieting....it is how many diets have you tried? There are so many different options & many of us have tried quite a few, if not all of them. What works for one person may not work for someone else. I have close friends who are extremely successful on diets that most people would heavily criticize. It is about you & what you can do. What you are willing to do. What your commitment level is. So here I am. It is hard for me to find motivation to be honest. I hate to admit that, but when have I ever held anything back from you all? Getting me to the gym is like pulling teeth. However, once I am there....I could work out forever. It isn't the exercise that I hate, it is simply getting me there. So I have to start somewhere else....my diet. Enter Shakeology. When I decided to give this a try, I think I was even feeding myself a load of BS. "I can have a shake a day as a meal replacement & I'll lose weight. No effort. Perfect." I tried to convince myself that I would like it when I have hated EVERY other protein shake that I have ever had. Unless of course it contained so much sugar that it should have been illegal. So here I go, wasting all of this money. Because ordering something healthy online = losing weight for certain. Yeah right! Something was different this time though. From the second that I hit send, I was excited. My package came in & I went straight to the post office to pick it up. I went home & immediately made my first shake. Brandon was in the kitchen with me. We smelled the chocolate Shakeology powder first, because I smell everything new before I taste it. Who's with me? It smelled amazing. Brandon was begging me to let him take the first drink but I knew that we had to do something first...pray. It went a little something like this, "Dear Lord, PLEASE allow me to like this shake. I need this & I need to be excited about it. Amen." Ok, stop laughing at me. I am totally serious. I wanted this, but I was scared of all of my other failures & horrible memories of chalky shakes from the past. So God had two seconds before my lips hit that glass to make sure that I liked it. Amazing! Those of you that follow me on Facebook or Twitter have already seen a few of my recipes & constant Shakeology discussions going on. This. Is. It. This is what is going to work for me. It already is. Not only am I already losing weight, my digestion is better than it has been my entire adult life, I have increased energy, & I have even (wait for it) worked out five times in the last seven! Holy smokes! I don't dread my shakes, I look forward to them. I even turned down dinner out with friends that I love tonight to go home & have my Shakeology, and I wanted to. Who am I? Hopefully, the new version of myself. A healthier person. I also want to mention that Brandon was begging me to let him share my shake or make him his own, and was even willing to pay me. He absolutely loved it & hasn't stopped talking about it. He helps me make my shakes & he wants to taste each one. Getting my kids excited about something that is so good for them is a blessing. One that I didn't expect or even consider. Brandon & I will be sitting down this weekend to discuss how we can incorporate Shakeology into his diet. Eating healthier as a family will be an amazing gift. For the last three years, I have loved & been blessed with every second of your support that you have given to me & to my family. Please join me on this journey as well. Let's do this together. I am excited for myself, my family, & what this can do for all of us. I heart Shakeology! Want to know more? Start out by watching this video, and stay tuned for my next post/vlog! I can't wait.